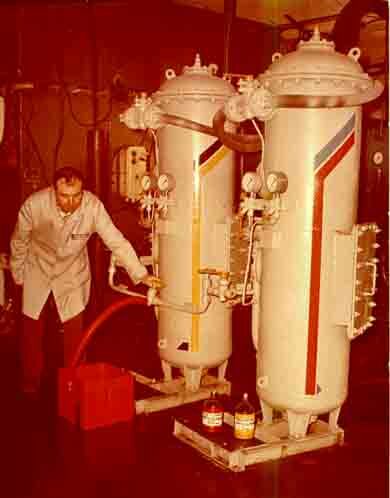 The USFA type separating units (the automatic filtering separating unit) developed and manufactured by the UkrNIIMF have a certificate of type approval of international pattern, which allows to use them on river and sea-going vessels operating on international shipping lines where the quality of oily water cleaning is required to be up to norms established International convention MARPOL-73/78 for the special areas. Besides these units have been successfully employed for cleaning oily production discharges from industrial enterprises. OPERATIONAL EXPERIE More than a 20-year experience of production and operation of the units in vessels of merchant marine under severe shipboard conditions (heaving, vibration, higher humidity, etc.) has confirmed stable high-quality separation; guaranteed reliability of operation of special devices and systems that ensure full automatic operation of the separation process (automatic starting and stopping, discharge of the separated products, periodical regeneration of filtering material). The experience of operating these units has shown that the actual mean oil content of the separated water amounts to about 1-2 ppm and the service life of filtering material is more than 10000 hours. DESIGN FEATURES The filtering material specific properties combined with its periodical regeneration (back flushing) ensure practically unlimited service life and guarantee stable quality of separation. The USFA type separating units are true to the world's best types and on some parameters surpass them. The technical solutions used in the design of the units have been protected by Author's certificates. All of the separating units possess the Russian Register of Shipping certificates and have been approved by ecological regulatory bodies of Ukraine and Russia. Maximum throughput capacity of SSC - 20 cu.m/h. High level of automation of the cleaning process ensures minimum operational costs (servicing personnel -I man). The SSC can be delivered to its place of destination by craft, a trailer, helicopter or rail-way platform. The SSC is an indispensible means of cleaning oily water generated on locations for washing road, rail way and other equipment (motor vehicle enterprises, stations of technical service, rail way car sheds, repair shops, etc.). The SSC will fit nicely into any water cleaning process adopted at industrial enterprises and individual shops.